The world and European champions Spain clash against Italy in the second semi-final of the FIFA Confederations Cup at Estadio Castalao in Fortaleza on June 27th, 2013. This game is a repeat of last year's Euro Cup final where Spain overpowered the Italian side and ended up winning the game with the score of 4-0. Spain earned their spot in the semi-final by finishing first in Group B ahead of Uruguay, Nigeria and Tahiti,while Italy came second in Group A behind Brazil and ahead of Mexico and Japan. Mario Balotelli will be out for Italy on Thursday due to a thigh injury. Spain are huge favourites to win this match. 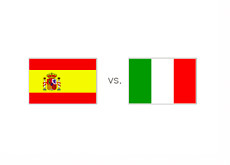 A $100 bet on Spain could return $36 in profit if successful, while the same bet on Italy could return $700 in profit. The most likely score according to the odds is a 2-0 victory for Spain valued at 6/1. Fernando Torres is the favourite to score for Spain at 5/6 (bet $100 to profit $83), while Alberto Gilardino has the highest odds of scoring for italy at 2/1. Can Italy avenge the last year's heavy loss in the final of the Euro Cup or will it be all Spain with their highly efficient quick passing game which did wonders in the last match vs. Azure.